Princess Cruises said today they would be returning to Japan for a fourth season in 2016. The cruises, which are focused on Japan are as popular in Princess’ traditional markets as they are with Japanese passengers. In the 2016 season, Diamond Princess will be offering an array of itineraries from four days to 20 nights. The cruises will sail from Tokyo and Kobe and include extensive port calls in Japan while several also include calls in Korea, Taiwan and Russia. There is no more information being released about the suspected murder-suicide that was discovered Thursday aboard Holland America’s Ryndam, but a local television station in Ohio has discovered an interesting backstory. There’s now one more way to get married aboard Norwegian Cruise Line ships. The captains of some vessels can now legally marry couples while the ships are at sea. Details can be found in the April 2 edition of Cruise News Daily. A suspected murder-suicide discovered today aboard Holland America's Ryndam. Royal Caribbean's choice for a godmother for Anthem of the Seas. A fatal accident aboard Cunard's Queen Elizabeth. It's no pink polar bear for Anthem of the Seas. 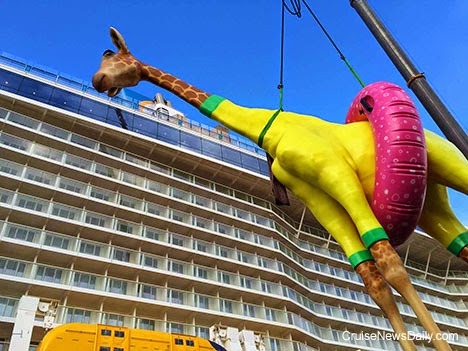 The signature artwork for Royal Caribbean's Anthem of the Seas is a giraffe in a swimsuit wearing an inner tube. The sculpture by Jean-François Fourtou, is shown here being lifted to the ship's top deck while it is in Bremerhaven during the final fitting out. The artist says the whimsical work is to remind you of the people and things one loves and cares for. Once Koningsdam finishes its inaugural season in Europe, it will shift to Caribbean itineraries for the winter 2016-2017 season. Holland America said today, the new 99,500-ton ship will be homeported at Port Everglades for the winter. Sur-prise! Sur-prise! Sur-prise, as Gomer Pyle used to say. Details appeared in the April 1 edition of Cruise News Daily. Carnival Australia ships have been carrying humanitarian supplies to the hurricane-devastated Vanuatu islands since, but passengers haven’t been allowed ashore during the schedules calls. That’s about to change, however. Passengers departing Brisbane this Saturday on Pacific Dawn will be allowed to go ashore when the ship calls at Port Vila on Wednesday. Like the ships before it, Pacific Dawn will be carrying humanitarian supplies and building materials to support the reconstruction effort, but just as important to the economy, passengers will be going into town to put dollars into the cash registers. Three days later, Pacific Pearl will follow and do the same thing. The complete story appears in the April 1 edition of Cruise News Daily. Princess Cruises is about to unveil to passengers a clever new activity (or two or three). Virtually everyone is already familiar with it to some degree, but no matter how unfamiliar you are, you can still have fun. Princess has partnered with Twentieth Century Fox Home Entertainment to present “The Sound of Music” (and related activities) on each of their 18 ships throughout the year. But it’s not just screening a movie. Details can be found in the March 31 edition of Cruise News Daily. Fincantieri delivered Viking Star to Viking Ocean Cruises on Saturday at their Marghera yard. While Viking River Cruises adds ships to their fleet by the dozen (literally), this is the first ship for the oceangoing line. MSC Sinfonia returned to service on Friday after its ten-week dry dock for lengthening at Fincantieri’s Palermo yard. During the process, the ship grew some 78 feet longer and added 5,000 gross tons. Details appeared in the March 30 edition of Cruise News Daily. MIAMI, March 30, 2015 -- Norwegian Cruise Line Holdings Ltd. (Nasdaq:NCLH) ("Norwegian Cruise Line Holdings", "Norwegian" or "the Company"), today announced the following appointments to its Board of Directors, effective as of March 27, 2015. Walter Revel, longtime director, has been appointed Chairman of the Board of Directors of Norwegian Cruise Line Holdings. Revel has served as director and Chairman of the Audit Committee for the Company since 2005 and as director of certain predecessor companies beginning in 1993. Since 1984, Mr. Revell has been Chairman of the Board and Chief Executive Officer of Revell Investments International, Inc., a diversified investment, development and management company located in Coral Gables, Florida. Since 2002, Mr. Revell has also served as a director of International Finance Bank in Miami, Florida, and became Chairman of the Board in September 2013. Since 1990, he has served as Chairman of the Board and Chief Executive Officer of Pinehurst Development, Inc., a family owned company. Revel also serves on the Executive Committee, the Board of Trustees and as Chairman of the New Museum Project Committee of the Miami Science Museum. He formerly was a director of Calpine Corporation, Dycom Industries, Rinker Materials, The St. Joe Company and Sun Banks of Florida. Mr. Revell served as Secretary of Transportation for the State of Florida in the Askew Administration. He is a past Chairman of the Florida Chamber of Commerce and was a member of The Florida Council of 100 for 37 years. He served as Chairman and CEO of H.J. Ross Associates, Inc., consulting engineers, planners and scientists, and continues as Senior Advisor to T.Y. Lin International, the new parent company, in San Francisco. Kevin C. Jones, a designee of Genting Hong Kong Limited, was appointed director of the Company. Mr. Jones is the General Counsel, Secretary and Senior Vice President of Corporate Development & Strategy for Genting Americas Inc., an indirect, wholly owned subsidiary of Genting Malaysia Berhad. Mr. Jones oversees all legal, corporate compliance, risk management and strategic corporate development matters for the North American operations of Genting Malaysia Berhad. Prior to accepting his current position with Genting Americas Inc., Mr. Jones practiced law at Cleary Gottlieb Steen & Hamilton LLP, serving as counsel for multi-billion dollar companies in a broad range of general corporate and real estate transactions. Blondel So King Tak, a designee of Genting Hong Kong Limited, was appointed a director of the Company. Mr. So joined Genting HK as Chief Financial Officer in July 2007. In October 2009, Mr. So was appointed Chief Operating Officer and in August 2014 was appointed Executive Vice President (Corporate Services) and Country Head of Hong Kong & Macau for Genting HK. Mr. So also acts as a director of various subsidiaries of Genting HK. He has over 23 years of experience in the financial sector with the first 15 years in the banking industry. Prior to joining Genting HK, he held a number of senior positions in multinational corporations and listed companies. Queen Mary 2 left Sydney this week at the end of a month that saw all three Cunard Queens visit the city, including a rendezvous between QM2 and Queen Victoria. 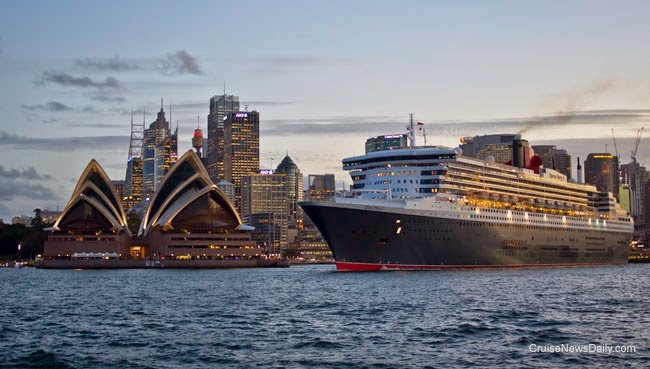 Queen Mary 2 is still the largest ship ever to visit Australia at 151,400 gross tons. 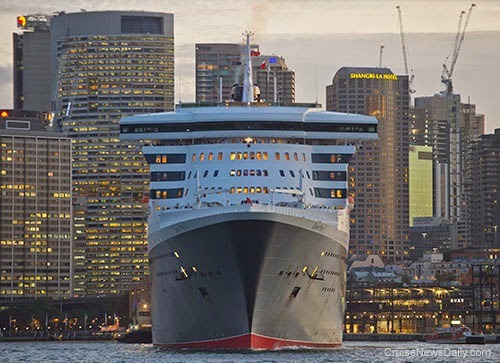 The three Cunard ships spent a combined total of six days in Sydney this month as part of their world cruises, and brought some 6,500 passengers to the city putting an estimated $3 million into the economy. All three ships will return next summer, again as part of their world cruises.